Yesterday, after work, I went for a run around Jamaica Pond. Along the way, many smells jumped out at me: the damp woody tones of bark mulch, the soft perfume of new flowers unfurling from the earth. There was a whiff of deodorant. Cigarette smoke and sweat. A musty breath of pond water. Wet dog. Car exhaust. At one point, I smelled the sulfur-sweet scent of a fire, which reminded me suddenly of California, that dry, arid state where I lived amid a blazing spate of them back in 2008. But here in Boston? Perhaps it was simply a barbecue, lit to celebrate spring. I wanted to share Season to Taste's cover design for the UK, where it will be published (by the wonderful Portobello Books) in August. I find it fascinating to see how the cover design changes from country to country. I'll be sure to share others as they come along. In the meantime, what do you think? Last weekend Matt and I celebrated a birthday with a (couple) bottle(s) of red wine, a hunk of creamy cheese and, later, an apple crisp. We shopped for discount clothes, navigating among herds of consumers laden with heavy bags and crumpled receipts, and then, exhausted, curled up on the couch to watch the final episodes of Mad Men. We finished our taxes and filled up our fridge. There was an intense bout of spring cleaning thrown in the mix. On Monday, we woke up at my dad’s house in Lexington, Mass, blinking and bleary in the pitch-blackness of 4:30am. After rolling out of bed, we walked the few blocks toward town center, where we stood in a surprisingly large crowd of people to watch a reenactment of a battle from the Revolutionary War. (Ah, Patriot’s Day.) And later that night, Matt and I gathered with the rest of my family and some friends for a Passover Seder, where we ate charoset and maror, brisket, matzah kugel and big wedges of lemon cheesecake. But what I want to write about now had little to do with any of that hectic activity, those planned events. One of the best moments last weekend came quiet and alone. Sunday, 5pm. Matt and I had just concluded the Clorox-scented cleaning of our apartment. I felt tired and my legs, sore. My hair was frizzy and my clothes, a mess. I’ll admit, I was anxious. I’ve been anxious. For a reason, though: I began a new job this week. A real job, with a real schedule, a real office, and real responsibility. Really, I couldn’t be more pleased. But, as always, anticipation is the worst part. So, Sunday. I sat at the kitchen table early that evening, the sun falling behind the brick-gabled buildings outside. Inspired by a recent article in Bon Appetit, I made myself a Negroni—a mix of gin, sweet vermouth, and Campari. Sunset pink, bitter and just a bit sweet. I sipped it in a thick glass filled with ice while listening to the sounds of the street, the hum of the radiator, the windows rattle and clink against the early spring wind. Mix all ingredients in a glass filled with ice. Stir. Enjoy. While Matt was deployed to Afghanistan, he lived on a small Army base outside a dusty town close to the Pakistan border. His recall to the Army from the reserves in 2009 had been a complete surprise, and the long months of this deployment—his third—crawled along in slow motion for both of us. Before I met Matt, I had never known anyone serving in the military. I hadn’t met a single veteran of America’s current wars. I didn’t know the difference between a sergeant and a lieutenant, a corporal and a colonel. I could easily pass over the boldface headlines charting the battles in Iraq or Afghanistan that littered the front page of the newspaper. I could read articles about soldiers wounded in battle or widows left at home and feel something, of course, but a transitory something, a feeling that didn’t cut, one that certainly didn’t last. Honestly? Before I met Matt, I didn’t understand the kind of pride that comes with serving something so vast as a country. I had no idea how far a sacrifice could reach. I don’t know what all that says about me. Or America at large. But having Matt called back gave me a glimpse into a world I had never known. Matt departed only months after I signed the contract for my book. At the time, I was living in a studio apartment the size of a breadbox in Brooklyn, where I spent most days of that year writing alone. While he was gone, we communicated through email and short, grainy phone conversations on Skype. I heard stories of Matt’s work on the base, of his patrols in the grim villages nearby. He told me about autumn helicopter rides over the vast mountains of Afghanistan and the hours trudging through deep feet of winter snow. Some of his stories were funny, others disturbing, all of them difficult in some way. I tried as hard as I could to show my love and support. I sent letters and packages filled with books and socks and homemade zucchini bread. I won’t pretend that I was perfect: over the course of that year I felt alternately angry, lonely, guilty, and depressed. But I knew that Matt—and all of the men and women so far from their homes and their families, fighting multiple tours of duty in the Middle East—had it much worse. And this is why it both surprised and touched me that, despite all of that distance and danger, Matt was able to send me tiny reminders of his love. I’ve made these cinnamon rolls a few times now. Yes, regular readers will be correct in assuming that I have an (unhealthy?) obsession with all things brioche, cinnamon sugar, pecans, butter, butter, and butter. But, hey, we only live once. And these cinnamon rolls, whether consumed on post in Afghanistan or here in Cambridge at brunch with friends, are just as good as Matt promised. This recipe comes courtesy of the now-retired Master Sergeant Daniel Borca, who I’d like to thank, so much, for his service, and his wonderful pastry skills. He and I have been emailing back and forth, and he's sent me another version of this recipe, one calibrated for a larger batch, which he recently made for his church. Email me if you're interested. I think I could manage to bake, eat, and write more about cinnamon rolls. You know, if I have to. These cinnamon rolls are rich and buttery, sticky and gooey, crunchy with pecans and thick with a vanilla-tinted icing—so pretty much the Best Thing Ever. It’s possible to make these in one day. But I like to spread the work out over a few, this way making sure I’m never in the kitchen for more than an hour at a time. I let the dough, and then the assembled raw rolls, each rise in the fridge overnight. This way all you have to do is roll out of bed on a Sunday morning, throw the pan of cinnamon-laden dough in the oven, whip up an easy icing, and there you go: immediate gratification, a decadent morning meal. First, dissolve the yeast into the water, and set aside. After a few minutes, it should begin to foam. Meanwhile, combine the flour, sugar, and salt in the bowl of a standing mixer and, using the paddle attachment, mix to combine. Add the softened butter and the egg. Mix until course. Now add the warm milk, and then the yeast and water solution and mix until a dough is formed. Be careful not to over mix: it should be slightly sticky, but pull away from the sides of the bowl. Place the dough in a lightly oiled bowl (turning to coat), and cover loosely with plastic wrap. Here, you can either let it sit at room temperature until doubled in size (around 2 hours), or throw the whole thing in the fridge overnight, and deal with it the next day. At this point, make the filling by mixing all of the ingredients (except for the pecans; keep those separate) together in a bowl. Set it aside. When the dough has doubled in size (or when you've removed it from the fridge and let it sit out for a half hour or so), divide it in two. Roll out each section, one at a time, on lightly floured surface in order to make a rectangular sheet about ¼-inch thick. Spread the the melted butter wash all over the surface of the dough, and then sprinkle the filling mixture, and then the pecans, liberally. Now, roll up the dough into a long log, and seal edges with a pinch of your fingers. Cut the log into even slices, about 1½-inches each, and place the wheels, cut side up, in a buttered baking pan. Whatever filling mixture falls out in the process, sprinkle over top. Here, you can let the rolls rise at room temperature until they’ve again doubled in size (about 45 minutes), or cover loosely with plastic and let them hang out in the fridge overnight. When you’re ready to bake, preheat the oven to 350 degrees F. (If they've been in the fridge, take them out and let them warm up at room temperature for a half hour or so.) Bake the rolls for 12 to 15 minutes. They should end up a light golden brown. While they’re in the oven, make the glaze: first melt the butter in a saucepan and then, off the heat, whisk in the powdered sugar. Add the vanilla and the pinch of salt. Stir in 3 tablespoons of milk to begin, and add more if the glaze is too thick. When the rolls come out of the oven, pour the glaze all over their tops. (Make sure you do this when they're still hot, so the glaze can soak right in.) Serve warm. With napkins. On Thursday morning last week, I sat at a table by the window of a coffee shop in midtown Manhattan. It was a cool, brisk day. Looking outside, I could see a vendor selling kabobs from a cart, his cooking smoke trailing up into the sky, and a FedEx truck double-parked on the street. High heels, iPhones, messenger bikes, skyscrapers, and taxicabs: The landscape of New York. Inside the cafe there were baristas in aprons, mugs of bitter dark roast, and the continual hiss of milk being steamed. The crowd of caffeine-guzzling stockbrokers in suits and tourists lugging large backpacks swirled around me as I sat, unmoving at my table. The scent of coffee saturated the air. I had been working for an hour or so when I noticed an older woman with craterous wrinkles lining her face stand up from the table to my right. She wore a towering fur hat—half Siberia, half high fashion, I thought—a thick pair of 1950’s-style, black-rimmed glasses, and lipstick as red as it comes. She stood in the corner, clasping her extra-large mug of coffee in her hands, and began to sing. There had been a mix of jazzy blues songs playing on the café’s sound system: Etta James, Bing Crosby, and the like. This woman simply sang along. Loudly. But she didn’t know the words. Mainly she just improvised, belting out a hum, warbling like a bird. Though I saw a few heads turn and a couple shoulders shrug around me, most of the café dwellers ignored the sudden influx of noise from this small, wizened woman in the fur hat. I watched her, transfixed. She had a good voice. She really did. She just looked so strange there among the blazered businessmen and women, the laptops and smart phones. She looked like a misplaced movie star gone to seed. Like someone who belonged in a different era. In a different body, another café, among a more dynamic crowd. But I watched her swing her hips, hum, and smile somewhere in space. And, I thought, perhaps she’s exactly where she wanted to be. Later that night, I walked along Broadway near Union Square, heading downtown to meet my brother for dinner. I used to spend a lot of time along that stretch of Manhattan, as I once worked in a building not too far away. It’s been almost a year since I moved from Brooklyn to Boston, and I’m still constantly shocked by how little, and how much, everything has changed. There are new restaurants and shuttered stores, fresh hordes of college kids and no sign of the guy who used to sell me coffee from the cart on the corner. I was comforted by the familiar rumble of the subway, the hot air spewing up from the sidewalk vents. That unforgettable scent of perfume mixed with spring and rain and concrete. I love New York. I miss New York, especially the tiny moments—like watching the sun sink below the Chrysler Building, like buying a Mr. Softee ice cream cone and eating it while walking down the street, like hearing an old woman sing to herself in a room where no one listens. That night my brother and I ate at Otto, a Mario Batali and Joe Bastianich-owned pizzeria on 8th Street and 5th Avenue. Ben and I have eaten there together many times—scores of meals shared, dozens of pizzas consumed. I’m not sure when we decided to make Otto a brother/sister tradition, but somehow we did. Traditions that sneak up on you are the best kind, I think. Ben and I used to eat at Otto once or twice a month when I lived in the city. Now, we visit whenever I’m in town. We always order the same thing: Pizza Marinara for me, (a simple yet gutsy pie studded with garlic and chilies), and Pane Frattau for him (tomato, Pecorino, egg—well, “two eggs, please”). A bottle of red wine. Sometimes we share a smattering of appetizers to begin. On Thursday, Ben told me that he had recently discovered something mind-blowing on the menu, something that I had never before tried. “Sformato di Parmigiano,” he said. “You’ll love it.” We ordered it, of course: a light and creamy Parmesan custard served alongside a radicchio and balsamic salad. When it arrived at the table, I took a bite. And then another. The pillow-like texture of the sformato with its rich, savory edge was cut by the sweet acidity of the dressing and the crunch of the purple lettuce. That first bite? It was a perfect bite. A perfect bite on a non-perfect night, the rain just beginning to patter on the dark street outside. That’s another kind of New York moment I miss. Yesterday I wrote a post about cinnamon rolls—a hot, gooey mess of a recipe; the best kind of recipe, really—and I’m almost done. But not quite. And in the meantime, I figure it’s time for another update on the book. April is here, which means that in a little less than three months from now, Season to Taste will be published. (June 21st, to be exact). Three months! I remember when the publication date was years away. Years. That was when Matt was deployed to Afghanistan and I was living in a tiny Brooklyn studio, spending long days outlining chapters, talking to sources, and reading reams of scientific literature. I felt sure there was no way I would ever finish. It just wasn’t possible that this mess of Word documents and interview transcriptions would ever find their way into a cohesive book. Thank God I was wrong. And so since I last wrote, my publicist at HarperCollins has been working hard to schedule readings and events. First off, I’m excited to be speaking at the BlogHer Food Conference in Atlanta at the end of May. (Anyone else going? I’d love to meet new folks!) And right after that, I’m heading to the BookExpo America in New York City. So far I also have a June reading scheduled at the Harvard Bookstore and others scheduled for July around Boston, in New Hampshire, and Vermont. Most of my writing career has taken place alone with my computer, with long hours behind a desk—I’m thrilled to move it out into the world. I hope to meet as many of you as I possibly can! "Molly Birnbaum writes with great curiosity and depth, reawakening in us all the sense of taste that we take for granted." "When Molly Birnbaum lost her sense of smell in a brutal accident, it was a tragedy for her plans to become a chef, and yet it was a strange kind of gift, too. Deprived of one sense, Molly drew on all the others, and on her memories of aroma, to become a masterful and moving writer. And we, her readers, are the ultimate beneficiaries of her great heart and her vast talent. 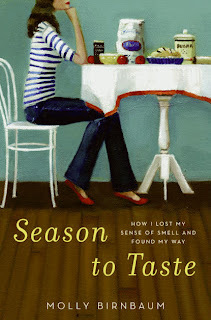 Season to Taste is a memoir, an inquiry, a rumination, and a love story, too, delivered with a poet's touch and a scholar's restless intellect." And, finally, here’s a link to the book’s Facebook page. Click “like” if you want to keep up on the news as it happens closer to the publication date. If you want to pre-order Season to Taste, you can click here, here, here, or here. Many, many, many thanks in advance. 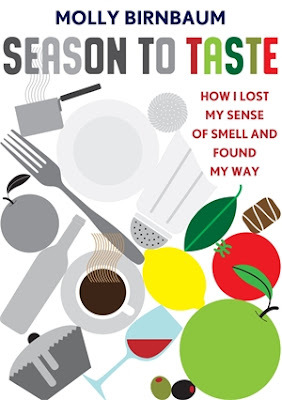 Season to Taste: How I Lost My Sense of Smell and Found My Way is out from Ecco/HarperCollins in the US. Available for order in hardcover here and here and paperback here. Read more about it here. 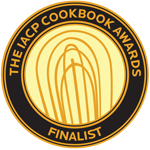 "Season to Taste" is a finalist for the 2012 IACP Awards in Literary Writing!